Those who did give Google consent, did not have their “personal” information and activity used for advertising purposes and tracking. 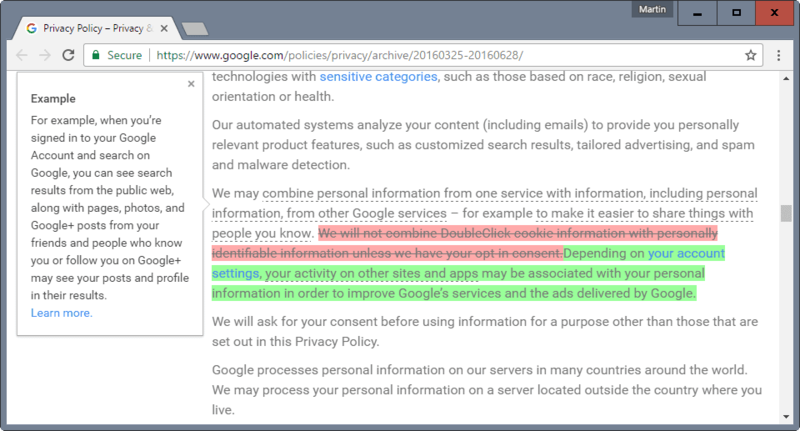 Depending on your account settings, your activity on other sites and apps may be associated with your personal information in order to improve Google’s services and the ads delivered by Google. This activity might come from your use of Google products like Chrome Sync or from your visits to sites and apps that partner with Google. Many websites and apps partner with Google to improve their content and services. For example, a website might use our advertising services (like AdSense) or analytics tools (like Google Analytics). These products share information about your activity with Google and, depending on your account settings and the products in use (for instance, when a partner uses Google Analytics in conjunction with our advertising services), this data may be associated with your personal information. Advertisement that you see on the web powered by DoubleClick, think Adsense for instance, may use personal information such as your name or your web activity to deliver personalized ads to you. While Google does not use all information yet for that, the content of Gmail emails for instance is not used to power DoubleClick advertisement on the Web, other activity is. The change is enabled by default for new Google users. Thimarts means that any new Google account is opted-in automatically so that personal information will be used for tracking and advertising purposes. Existing users on the other hand were prompted to opt-in to the change this Summer according to the Pro Republica article that broke the news. If you don’t want that, you may want to check your Google Account Activity to make sure you are not opted-in. 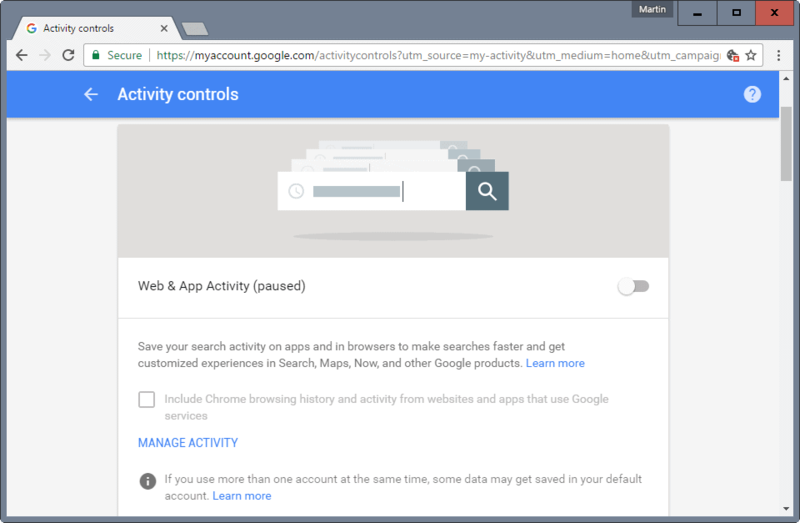 We talked about the My Activity dashboard that Google provides you with to manage and control activities before. You need to open the Activity Controls on the page to manage those. There you find listed at the top the Web & App Activity service. I recommend that you disable that, but you may find it useful. If that is the case, make sure you uncheck the “Include Chrome browsing history and activity from websites that use Google services”. This entry was posted on Monday, October 24th, 2016 at 10:42 am	and is filed under privacy, tech tips. You can follow any responses to this entry through the RSS 2.0 feed. Both comments and pings are currently closed.